This deluxe comfort series memory foam office chair from Mayline was designed for call centers and other intensive use or long hour applications to provide the user with a durable and comfortable all-day seating solution. 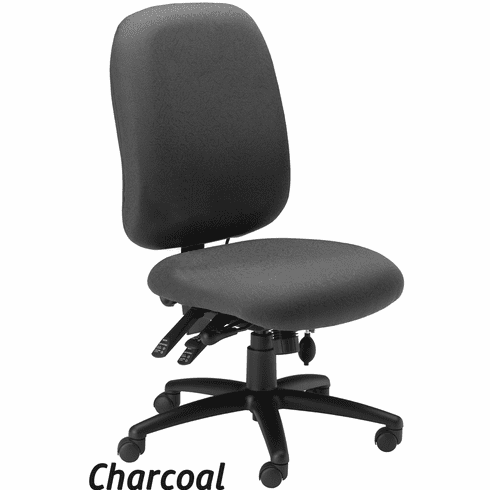 This durable chair includes a high-density memory foam cushion and enhanced lumbar support to provide added comfort, making it perfect for call and dispatch centers or medical facilities. The multi-function controls allow for independent adjustment of both the back and the seat, including angle, pneumatic height, and tilt. This dispatch chair comes with a heavy-duty base and dual casters and can support up to 300 lbs. This is a standard option without arms, but adjustable T-shaped arms can be added for an additional fee. Comes with a Mayline limited lifetime warranty, and meets or exceeds ANSI/BIFMA standards. Chair supports up to 300lbs. Optional T-shape adjustable arms can be added for a minimal charge. This Mayline 24 hour, comfy office chair normally ships in 1 business day.